All transactions are safe and secure with a reliable history in online purchasing behind each of our associates. 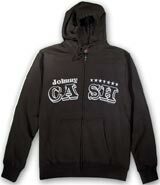 Buy the Johnny Cash Sweatshirt Hoodie to own Johnny Cash clothing and merchandise. Zip up for those chilly summer nights sitting by the fire. This Johnny Cash hoodie sweatshirt is perfect for a cool night at a concert or a breezy day at the park. The black zip-up drawstring hoodie has two pockets and is available in four different sizes. The name Johnny Cash is printed on the front in white with the first two and the last two letters of the last name seperated by the zipper, giving this unique Cash sweatshirt its own cool style. In addition to the Johnny Cash Sweatshirt Hoodie above, browse the Johnny Cash Clothing Gallery for more apparel like men's and women's clothes, kids shirts or hoodies.